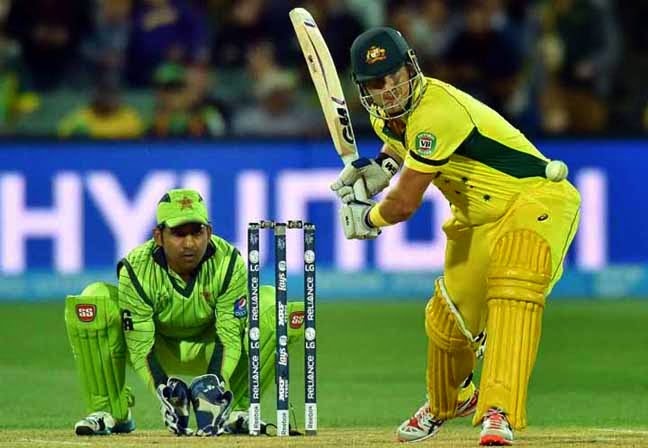 Adelaide : Australia defeated Pakistan by six wickets to enter the semi-finals of the cricket World Cup at the Adelaide Oval here on Friday. After bowling out Pakistan for 213 in the third quarter-final, Steven Smith (65) and Shane Watson (64 not out) helped Australia overhaul the target with six wickets and 16.1 overs to spare. Australia will take on defending champions India in a semi-final match on March 26. Set a modest target of 214, Australia overcame a tumultuous start to go past the finishing line in 33.5 overs after the home pacers, led by Josh Hazlewood (4/35), wrecked the Pakistani line-up. Steve Smith top-scored for the Aussies with a 69-ball 65 knock, which was studded with seven fours, while all-rounder Shane Watson survived early jitters to carefully craft an unbeaten 66-ball 64, including seven fours and a six. Pakistan had themselves to blame for the World Cup ouster as they dropped two easy catches, allowing the hosts to wriggle out of a precarious position. Australia's chase was not off to a very smooth start with opener Aaron Finch departing in the third over after contributing just 2 runs. The David Warner blitzkrieg also ended pretty quickly after the dasher had made 24 off 23 deliveries, including three fours. In fact, Wahab Riaz was simply outstanding in his opening spell of six overs, during which he snared two wickets conceding only 24 runs. The pacer bowled with aggression and passion, unsettling the Aussies with not just his deliveries but also with occasional glares and constant chirps, which irked the batsmen and invited jeers from the packed crowd. Riaz could well have pulled off three wickets in the opening spell had Rahat Ali held on to a dolly in the 17th over when Watson was on just 4 runs. He eventually finished with figures of 2/54 from nine overs. Australians were poised rather precariously at 59 for three after skipper Michael Clarke (8) failed to click. However, Smith and Watson shared 89 runs for the fourth wicket to steer Australia out of trouble before Glenn Maxwell (44 not out) guided them to victory and a semifinal showdown with India.